You want to write and sell ebooks. Deep down you know it’s possible, but you don’t know where to start. How do you find a topic? How do you actually write the ebook? What do you do when it’s done? Figuring all this out for yourself can take ages. I know, because it took me ages. I wrote my first ebook in 2007 and failed completely. I even ended up wasting thousands working with a coach. Luckily, I came back and tried again and again until I figured it out, which happened in 2009. Things finally clicked, and I sold my first small ebook to a very small list of people and sold over 4-figures. But there was still more to learn. So much more. 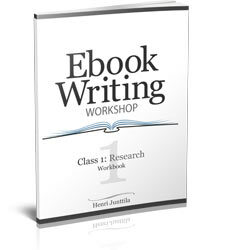 The Ebook Writing Workshop is simple, practical and to the point. It’s free from guru hype and contains real-world strategies that have worked (and still work) for me. These are the strategies I use day and day out here at Wake Up Cloud HQ. However, writing and selling ebooks is overwhelming if you don’t have a process, a system if you will. That’s why you’ll learn my simple process of how I get most of my ebooks and courses done within just a few weeks. You’ll get a structured set of materials to work through, which are designed to help you minimize overwhelm and get real results. At the end of this workshop, you’ll either have the tools to write and sell ebooks for the rest of your life, or you will already have written one. I always wonder if courses like this will work, and I know enough about the topic that I often hesitate because I don’t know how valuable it would be. Based on my previous experience with Wake Up Cloud and Henri I thought it would be good to get your perspective and approach since I had really liked your other work. The price was not an obstacle, I was pleasantly surprised. As a result of taking this workshop, I found myself getting really focused. Walking through the entire ebook writing process helped me to better understand how to do “ebook” type research, which may not be unique, but has enough specific requirements that, once I went through them, helped to really focus what I was writing about. What I liked most about the workshop was walking through real steps, getting the over-the-shoulder view of how you create your ebooks. I always find that very helpful and this course delivered it really effectively. I also found that I felt much better about the process of breaking tasks down into small steps and not trying to take it on as one big effort … it may be something I know, but don’t always do, and the way the steps were laid out (with good examples) really helped. I would recommend this to anyone who is interested in starting an eBook and would benefit from a helpful and reasonable framework. This is the self-guided version, which means that when you join, you’ll instantly get access to everything (yes, absolutely everything, even me :)). As you can see, you get a lot of stuff, but it’s structured, so you learn one thing at a time. Before we take a closer look at what exactly you’ll get, I want to show you something a workshop participant said. At first I was hesitant to spend money on yet another course on how to make money online (I’ve been burned before), but after going through your workshop, I realize I now have the knowledge to create a quality ebook practically out of thin air. It will be a valuable tool in my online presence toolbox. Your ebook workshop was well thought out and has very easy to follow steps. Well worth the money. The absolute first thing you’ll do is find a hungry market for your ebook. You could spend a lot of time creating your ebook and if no one wants to buy it, you’ve just wasted a lot of time. That’s exactly what you’ll learn to avoid in this first module. After the audio class, you’ll go to the workbook to get clarity and to the tutorial to see how I do things. I’ll be writing my own ebook alongside you in the tutorial series. You’ll get to see exactly how I write ebooks. This is the most exciting module of the whole workshop, and you’ll see why when you go through it. It’s all about planning your ebook before you even write it. It’s in this module that you’ll truly create your ebook, and this is something most people miss. They have all of false beliefs running around in their mind that hold them back from success. It’s stopping them from writing a fantastic ebook, fast. After the class, you’ll again go to the workbook, which is laid out in a simple, step-by-step fashion so you can implement. Then you go over to the tutorial, where you’ll get to see over my shoulder on how I blueprint my ebooks. This alone will blow your mind (in a nice way), because you’ll get to see how it’s done, and it’s NOT what you think. Next, we’ll dive into writing your ebook. This is where most people get stuck, but you won’t, because you’ll discover a few simple techniques on how to keep writing when things get tough. This is stuff I’ve learned the hard way. The workbook and then to the tutorial, where you’ll see what my first draft looks like. Then we’ll move onto editing, which is a lost art when it comes to writing. Most people don’t know how to edit and rewrite properly. This module will change the way you look at writing ebooks (and articles). And then you move onto the workbook. After that, you again get to see over my shoulder on how I “sculpt” my ebooks (on video, live). The technical stuff is always overwhelming and frustrating. In this module I’m going to show you step-by-step how you can get everything set-up and ready to sell your stuff without being a technical Jedi. And this is a special module, because it’s all video, so you can SEE how this is done. This class won’t have a separate workbook and tutorial, because it’s all baked into the videos. Finally, we come to one of the most important parts of the workshop, which is getting people to buy your ebook. It’s not enough to just write your ebook, you have to know how to sell and promote it. Now, this isn’t hard, but if you don’t know what you’re doing, you can significantly hamper your chances of selling your ebook. After the audio class, you’ll go to the workbook, which will again help you answer all of the questions you have and get you into action mode. Now, let’s look at what else you get when you join this workshop. Most product creators wow you so you buy their product, then they leave you in the dust if you have trouble. I’m there to help you if you get stuck, so you’ll get access to my private email inbox. I’m doing this to help you, but also because I want to know what works and what doesn’t. This will help me discover what works and what doesn’t, which will make my life so much easier when I add new material. In this bonus class you’ll learn the 5 simple ways to double, triple or even quadruple the price of your ebook. Once you have that first ebook done, there’s almost no limit to what you can do to deliver more value and make more money. These tips are very simple and doable by anyone, even if you’ve never done this before. I want to reward action takers, so for this home-study version, I’m going to give the first 15 people a free 30-minute strategy session with me. This will never expire, so you can use it whenever you want, and if you’re reading this, that means the bonus is still available. You can use this to get clarity on what you should write about, how you should sell your ebook, or even get me to critique your ebook outline. I was a little concerned about the price, but I will have to add that it was your sales page that convinced me to get your course as opposed to others that were less money. Specifically it was your heading “even if you don’t think you can write”, – because that was me. I didn’t know where to start, how to find a topic, or how to begin writing. I thought the workshop/course was very well presented. As to how it has affected by ebook writing, I would say that I realized that it is very important to write about something you are interested in (and the research portion helped me with this as well). What I liked most was the help that you provided – always offering suggestions and motivation for those of us who wanted to always do something “perfectly”. You never made me feel that you were too busy to help out and answer questions! I liked that! I think I would have to say my biggest learning was making an outline first and then doing the writing, with research running a very close second. I would recommend this online workshop to others because it is a step-by-step method and because of the help that you offer. I would just like to add a “Thank you” to you. 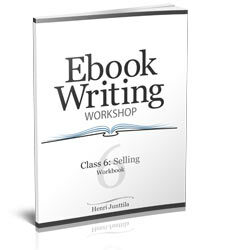 What’s it worth to have the skill to write and sell ebooks? These same skills can be used to create online courses and programs that you could sell for $100 or more. I thought about charging more for this workshop (think $197), and the price will be going up in the future. When you get it right now, you’ll get access to updates if and when I add new material and upgrade it. Right now you can get it for just $67. You get instant access to everything, and you get my personal email address just in case you have trouble or questions. Simply click the button below, fill in your details on the next page, confirm, and you’ll get an email from me with further instructions. As with all of my products, you can test-drive the workshop for 60 days and if you don’t absolutely love it, you can get your money back. I’m not going to hassle you or ask you questions. I’ll refund your money instantly. The risk is on me, so you have nothing to lose, and everything to gain. Q: Will I get immediate access to everything? Yes, after you pay, you will get an email from me. In that email you’ll click a link, which takes you to the secret workshop email list. Once you fill in your details there, you’ll be redirected to the goodies, so you can download them and get to work. And if you have any questions, you’ll get access to me through the newsletter. Q: What if I’ve never written an ebook before? Then you’re in the right place, because that’s what this workshop will help you do. Just email me and I’ll help you out. I’ve already gone through this workshop with dozens of members, so it works, and works beautifully. Q: Will this work in my market? Chances are there are books, programs and courses sold in your market, which means you can sell ebooks. If there aren’t, you may want to re-evaluate why you’re in that market. If you’re really unsure, you can always email me and I can give you some tips. If you sell just 4 ebooks at $17, that’s $68. You’ll have made your money back. And you will have learned a life-long skill that you can use to sell more and more. If that sounds interesting to you, click the button below and let’s get started, shall we? If you have any questions, just shoot me an email and I’ll get back to you ASAP. P.S. Remember to click the big button below to started.